Buy CISS Brother DCP-115C and make 30 times more quality prints for the same money! Pay only 0.04 USD for A-4 full color print! The multifunctional device we overview Continuous Ink Supply System for combines functions of a printer, copier and scanner. CISS for printer Brother dcp-115c help users to print not only texts an images from a computer, but also scanned and copied materials as much as you need. The printer itself is a compact convenient device for affordable price. Added to its basic tech characteristics CISS makes a printer improved and better version of itself. Tech features of the CISS doesn't differ from others a lot. Like CISS for brother dcp-120c it has special tanks with inks in each, tube and chips to supply a printing head with inks. They both enable more convenient and cost-effective printing. Continuous ink system brother dcp-115c performs all the benefits of innovative tech development. It has got 4 colours in a set and you should order INKSYSTEM dye based ink for better work. System works on a principle of constant ink feed on a special loop. Bulk ink system for brother dcp-115c consists of three parts, which are the donor, silicon cable (tube) and chips. Tube is made of premium class silicone, which guarantees flexibility and strength. The donor is a set of four 150ml containers each, while original cartridges contain only 8ml of each colour. Chips are updated with the reset button after inks finish. Factories in South Korea provides high quality CISS, among which not only our CISS for dcp-115c, but also known ciss for brother dcp-130c. 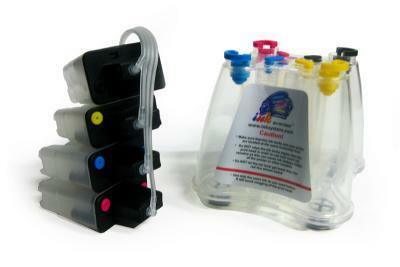 Inksystem is among the first who start producing and selling alternative consumables. During the years of manufacturing, the company constantly improves its products and implements new technologies. Modern CISS is a next generation device for home, office and professional use, because this device helps to save on printing a lot. If one has tried he system just once, he will say for sure, that it is convenient, not expansive economizing device which let not only to save, but forget about wasting time on buying and reinstalling cartridges every month. Pros are clearly seen. CISS dcp-115c economy is no doubt as printing costs reduce 20 times with it. Apart from this we must mention its quality, productivity and general convenience. A system prints around 15 times longer than an original cartridge, that shows its time-effectiveness and productivity. There are many investigations and reviews of Continuous Ink Supply System, and they don't bring us the only opinion. But as experience shows, before speculating on something it must be tested yourself.